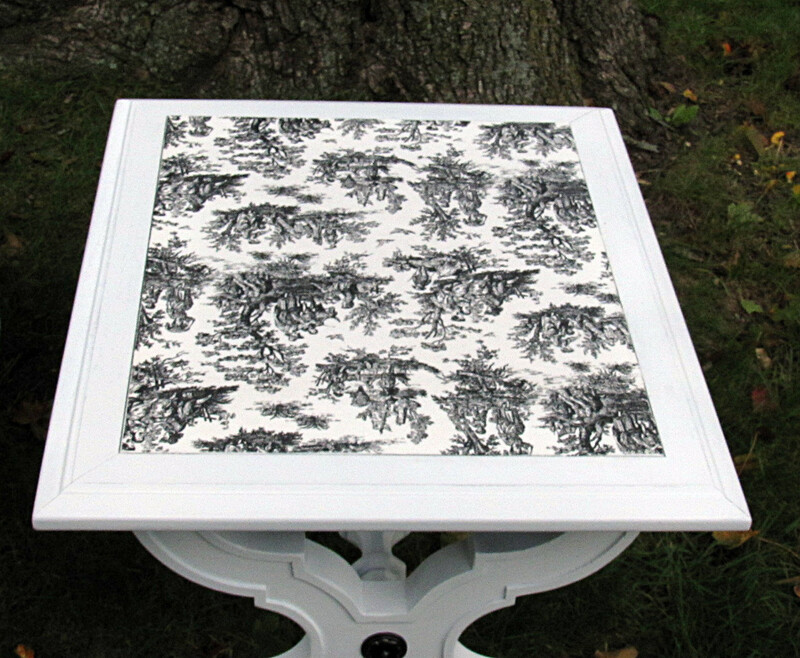 My Toile Tables seems to inspire alliteration. Deborah from upcyclingmylife wanted to know how I did the fabric insert on these tables so today you get to find out and hopefully, you'll find some cool way to use fabric on your furniture as well. It is super easy. Dry fit the fabric. This means check the fit and placement BEFORE you start gluing and sealing. You'll be glad you did. Don't worry about any threads right now. It will be better to cut them when the glue has been applied. And never pull! It will fray your fabric edge and look messy. 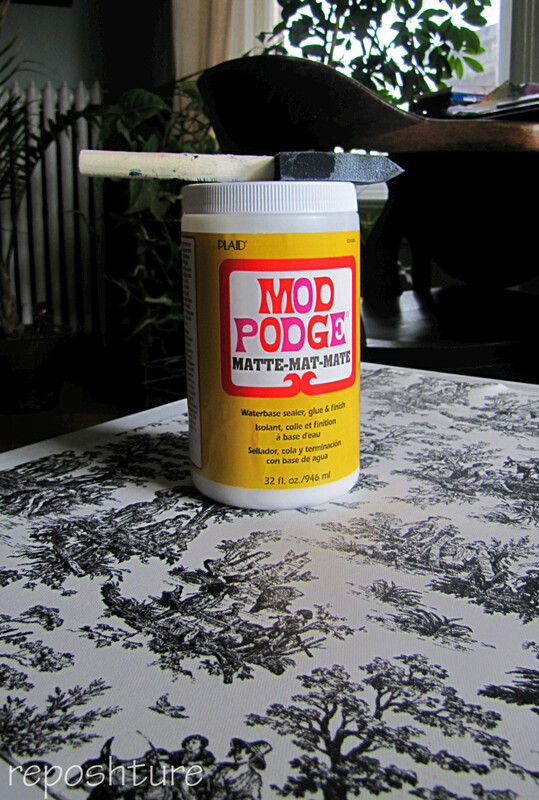 Now get your Mod Podge and a foam brush. I like foam because it doesn't leave brush marks on the finished product. slowly lower the other half in place. Smooth out all air bubbles. 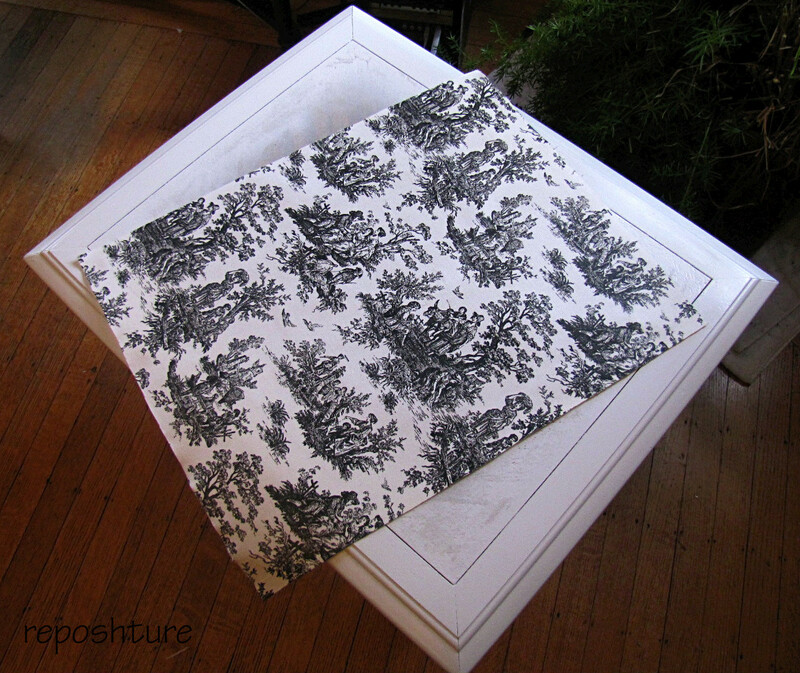 Move slowly because every time you reposition your fabric, you will pull it out of shape slightly so take it slow. The directions on the bottle say to Mod Podge the fabric before placing it on the wood but I think it works out better this way. 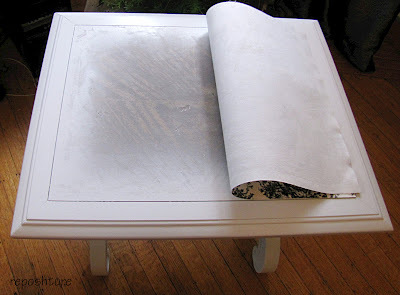 ﻿Let the glue dry first before starting to add your layers of Mod Podge over the fabric. If you don't you will move the fabric a bit. 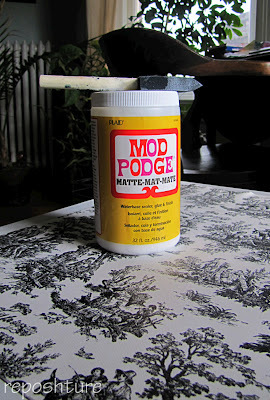 The Mod Podge is cloudy when wet and clear when dry. 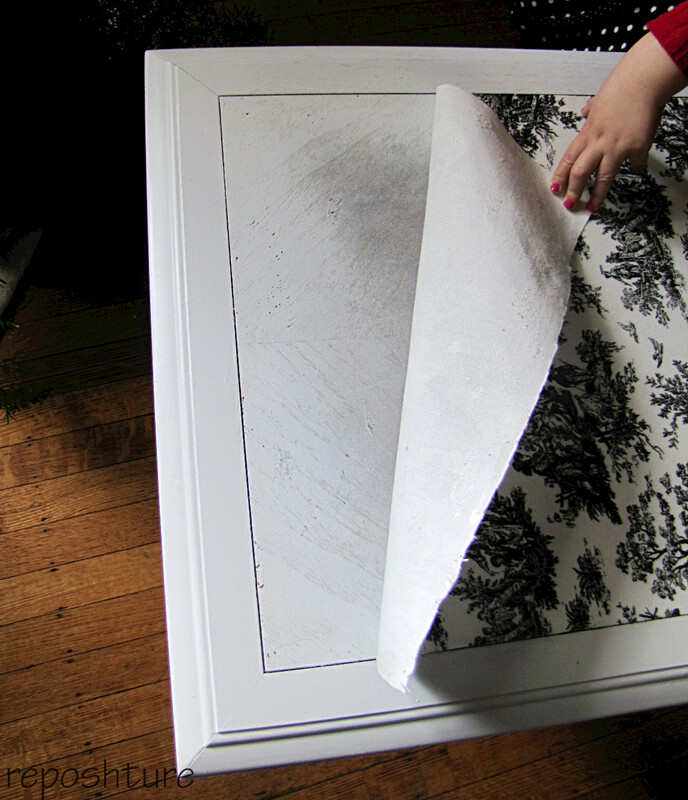 It takes about 10-20 minutes for each layer to dry. I sealed the fabric with 4 layers of Mod Podge. Make sure you brush the sealer on in BOTH directions. That way you hit all the fibers well. At this point you can cut any threads that peek out from the edges. I also added a bit more sealer to the edges to make sure it adhered well and didn't lift over time. The fabric will now feel VERY rough. Take 180 grit sandpaper and sand it a bit once you are happy with how it looks or you are tired of gluing, which ever comes first. This will make it feel very smooth and finished. You can also give it a light sanding in between layers of sealer but I did not. 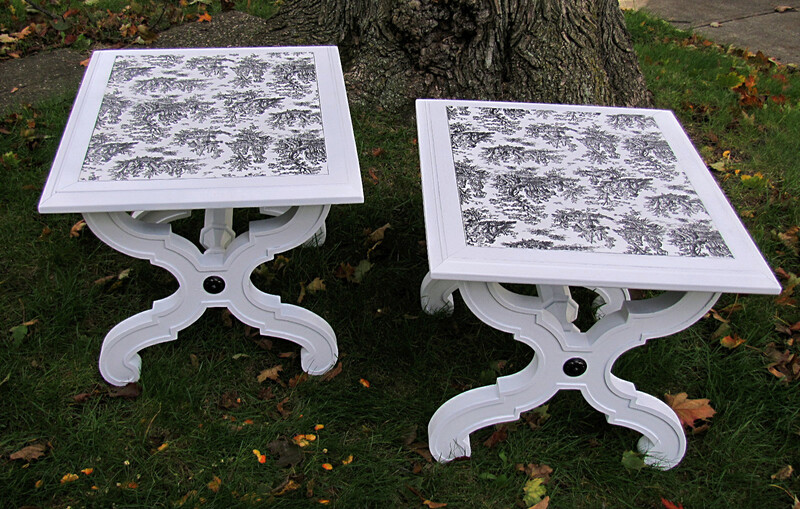 Now you have Totally Terrific Toile Tables! Well young 'un, your tutorial is JUST the thing I need to do a very WEIRD step-table I have...will get around to it eventually, and will give you the fabric tute credit of course! Let me know when you finish the re-do, would LOVE to see it!! You've done a beautiful job and your instructions are clear and easy to understand. 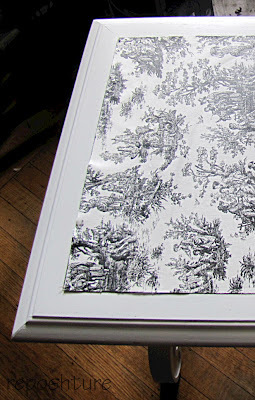 I will have to try this on a piece or two. Thanks!